Разстояние до летището 44,1 км. Имате въпрос към Lake Akan Tsuruga Wings? Ако това, което търсите е хотел с добро местоположение в Куширо, не се колебайте, а изберете Lake Akan Tsuruga Wings. Този 4.5-звезден хотел е леснодостъпен, тъй като е само на 60 km от летището. С удобното си местоположение хотелът предлага лесен достъп до всички градски забележителности, които задължително трябва да се видят. Възползвайте се от богатството на ненадминатите услуги и удобства в Куширо. Докато са отседнали в този чудесен хотел, гостите могат да се насладят на ежедневно почистване, камина, магазин за подаръци/сувенири, обществена пералня, 24-часова рецепция. Като допълнение всяка хотелска стая предлага широка гама от удобства. Много от стаите са с телевизор с плосък екран, безжичен интернет достъп (безплатен), стаи за непушачи, климатик, отопление, за да удовлетворят и най-изискания вкус. Хотелът предлага прекрасни развлекателни съоръжения, такива като гореща вана, сауна, спа с гореща изворна вода, спа, масаж, които ще направят престоя ви незабравим. Каквато и да е причината за Вашето посещение в Куширо, Lake Akan Tsuruga Wings е идеалното място за една вълнуваща почивка далеч от всичко. Гостите, които са резервирали стая с вечеря трябва да се настанят преди 19:00. В противен случай няма да се сервира вечеря и цената й няма да бъде възстановена. Деца на възраст 7 и повече години се смятат за възрастни. Деца 1 - 6 години ще бъдат таксувани JPY 3,240 за изхранване, ако използва допълнително легло. Everything will be 100% perfect if the buffet provides more choices and more delicious food. The good thing was that the hot spring facilities were clean. be in a good positionThe bad thing is that the person who puts the bedclothes on the room is very dirty. There is a lot of dust. I'm sick and tired of eating two meals. The smell of food in the building is vibrating. the services quality of the reception is bad. They will not ask me when i go buffet and prepare bed for me. they never ask me how many bed they need to prepare for us. When I want to say what I want, their attitude is arrogant. Perhaps they will think that their facilities are very good, and there is no need to listen to their guests' opinions But such attributes really destroy the mood in my trips. Hear said that their buffet is very good, but this time, their food level is only average, price-performance ratio is not high on their buffet. The overall experience is bad. But their hot spring facility is good. 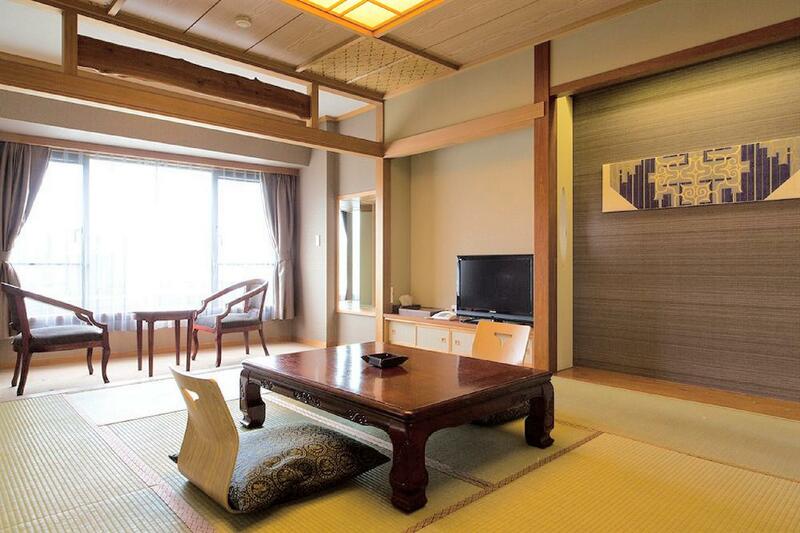 Good location just like 5 mins walk from JR station, shopping area and convenient shop nearby. Room is spaces, clean and the staff are friendly and helpful. Highly recommend for family travel with young children and need to travel by JR within Hokkaido. Thanks! Service is good and Hotel staff are friendly and professional. I love the space of the hotel room, and the lakeview is beautiful. Breakfast and dinner is included in the booking, we need not to worry too much to get the food for young children. This hotel is right near to the Ainu Village. 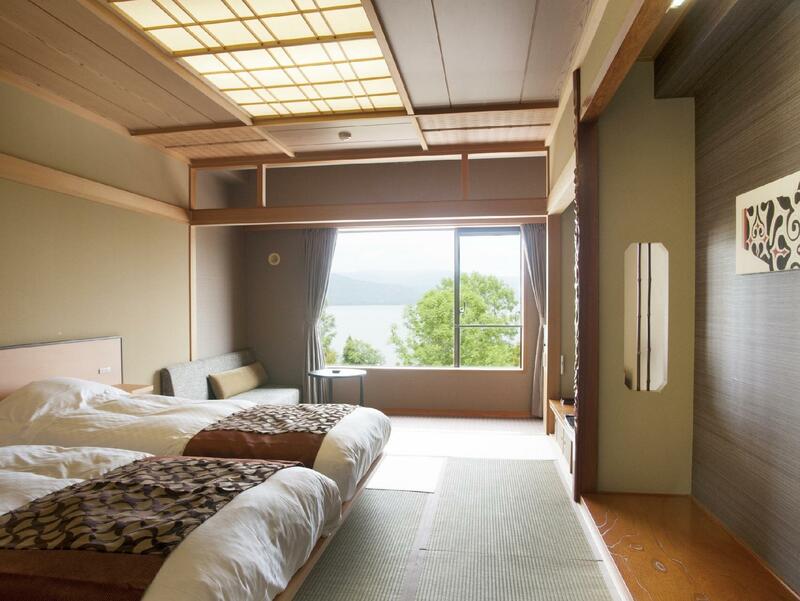 There are 2 big onsen for you to explore in this hotel and its just beside lake akan. I was able to jog around the lake in the early morning. It was really nice. The buffet dinner and breakfast was excellent. Room is spacious, comfy and clean. The Onsen on the roof was amazing! Free Wi-Fi, valet free parking. The hotel is old, dated, but pleasant. Brekky and dinner (included) were of good standard and varied. The harp concert was a nice bonus. The receiving staff was great when checking in but when checking out, there was none to help with the luggages. The facilities was amazing but confusing to find because the staff was limited in their knowledge of the English language and there was very little English written directions how to access some of those facitilities. The best part of this place is the buffet. We truly enjoyed the different cuisines offered in the buffet room: Japanese, Chinese and Italian. Checkin was fast. Hotel was quite packed and no one assist us on the luggages. Requested for non smoking room, but the room given was full of cigerettes smell. Unable to change room. In the end, our sleeping wears were full of cigerettes smell. However, the location of the hotel is directly opposite the shopping streets, which make it very convenient. The onsen was huge with variety of pools. This is a good resort and you will have a relax stay here, I particularly like the outdoor onsen. Room is very big and clean. Staff is very helpful. The only drawback is that dinner/breakfast quality is not that good although they do have plenty of varieties. Overall a decent resort. 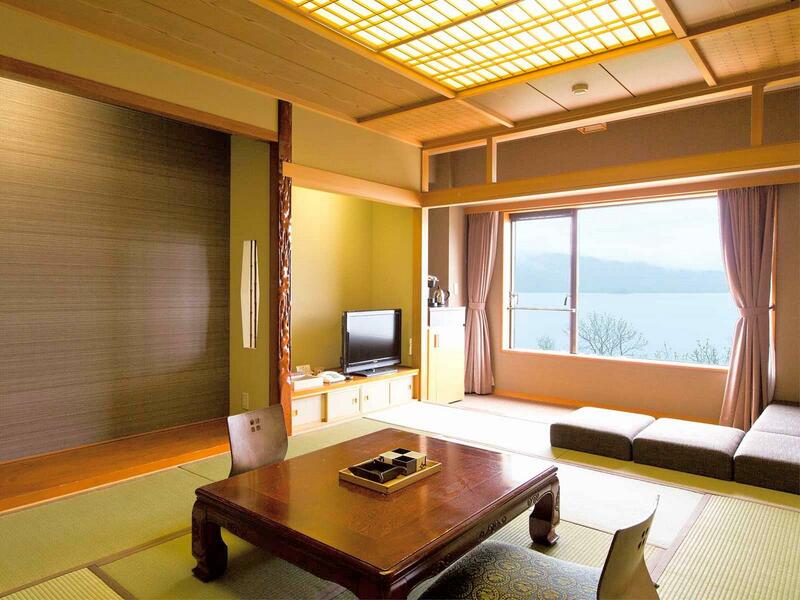 Tsuruga Wings is a modern hotel conveniently located in Lake Akan town with beautiful facilities. It is connected to its more luxurious sister hotel and guests are able to enjoy the hotsprings in both hotels. The souvenir shop at the sister hotel proved a popular spot with local tourists, with the food souvenirs being wrapped up by the cartons. Although it was busy and seemed fully occupied with many guests, the hotel still felt relaxed and stately when browsing around at the ground floor. The dinner buffet was surprising with a mix of international dishes and quite appetizing in general. I was able to enjoy the beautiful and spacious onsen in quiet and peace by myself in the morning. 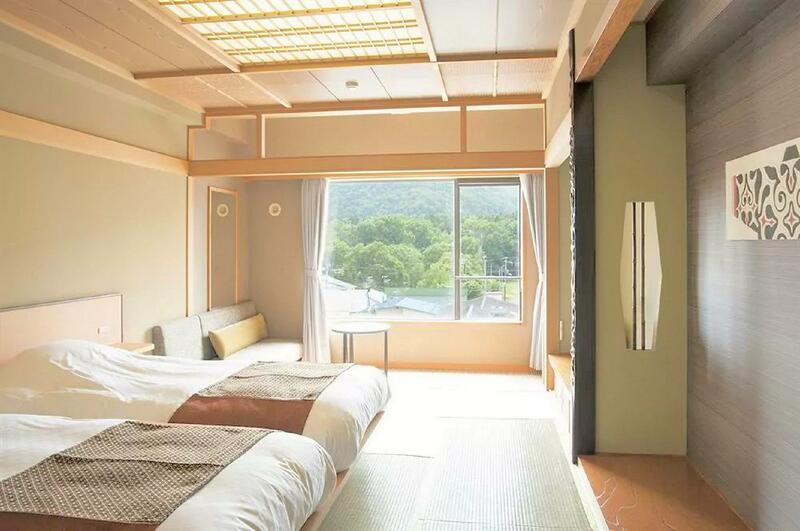 Perhaps most guests chose to visit the other onsen at the sister hotel. The room complemented the whole tranquil feel of the hotel. One plus point of the hotel was that it has valet parking. The stay was well worth the splurge. I will consider staying again at this hotel group. Room is spacious and very good view as my room was facing the Lake Akan. Breakfast and dinner is above standard. the dinner is just ok but there are no many choice in that area, the lake side view is wonderful! it is very enjoy to have spa. More than 85% guests stayed in this hotel were Putonghua speakers, you will be bookmarked as a Putonghua speaker by the colour of the dinner voucher. If you are holding the dinner voucher is in grey colour, you will be served by a staff who speak in Putonghua whenever you speak in Putonghua or Cantonese. Onsen is good and large. Compare with other hotels in Lake Akan, the location is not good, a bit far to travel between the venue and Fuyu Hanabi and the hotel. For the breakfast and dinner, extreme disappointed, Overall, if you want to have a quiet stay in Lake Akan, I think Tsuruga Wings will not be your good choice.